Over the Rainbow Vegetarian Retreat01239 811155work Guest HouseOver the Rainbow is a relaxed, informal vegetarian/vegan country retreat, with quality ensuite accommodation in a restored Georgian mansion. Totally off the beaten track for a get-away-from-it-all holiday secluded in acres of woodland and gardens. You can stay B&B in this Green Tourism Gold award winning accommodation, or hire the venue exclusively for small group holidays, retreats, family celebrations, civil wedding ceremonies, residential courses and workshops. Here you can totally unwind and relax just watching the stars and listening to the silence. Book yourself some well earned time out, in our well appointed, sumptuous, centrally heated rooms. Single double and twin ensuites with idyllic views of the Welsh countryside from every window, the décor reflects influences of female myths & legends from around the world. This is an ideal base for walkers to explore the all Wales coast path and Pembrokeshire National Park. Situated only 3 miles from Cardigan Bay coastline, you will be perfectly placed for a relaxing day of dolphin watching; relaxing on the beach, visiting National Trust properties at Mwnt or Llanerchaeron estate at the seaside town of Aberaeron; exploring numerous castles including the recently restored Cardigan Castle. Take a gentle stroll around the Welsh Wildlife Centre; Cenarth Falls; Devils Bridge or visit the many public gardens, galleries, studios, farmers markets and antique shops in this peaceful coastal county. (Please note that a minimum of two nights booking always applies to the Fuji and Parvati rooms, and all rooms during Easter, July and August. Over the Rainbow can accommodate up to 10 guests overnight in five rooms with flexible room layouts. You can stay B&B or we can provide full catering for groups, whether that is for group holidays, retreats or residential courses. Apart from our communal dining room, there is a guest library where groups can gather in the evenings to watch TV or play board games by the woodburning stove. We also have a ballroom which is very well suited to dance, yoga, pilates, and other alternative retreats. 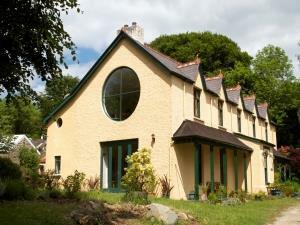 Over the Rainbow, Vegetarian Retreat, Cardigan Bay. A restored Georgian Mansion in acres of woodland and gardens. Over the Rainbow is a relaxed, informal vegetarian/vegan country retreat, with quality ensuite accommodation in a restored Georgian mansion. Totally off the beaten track for a get-away-from-it-all holiday secluded in acres of woodland and gardens. Pets accepted with bookings in the Nefertiti room. Continental breakfast on Tuesday, Wednesday and Thursday mornings. Cooked breakfast other days. Children welcome from any age. 7 miles north of cardigan on the A487, turn right onto the B4333 at the Gogerddan arms pub. Continue on b4333 fort 1/3 mile, look for the postbox built into the wall of Tyllwyd lodge. Turn right here, follow the bumpy track for half mile following Over the Rainbow signs to the victorian iron gates / slate sign.